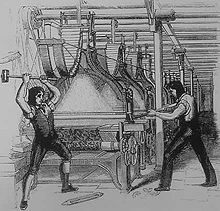 The Luddites were English textile workers who violently opposed mechanization of their industry between 1811-1816. They liked to smash things, automated looms usually. The movement was so popular that the British army had to get involved to quash it. Now a “Luddite” can refer to anyone opposed to innovation, often involving technology or computers. Which brings me to the point of this blog. I consider myself a bit of a Luddite. (It sounds quite flattering actually–“Hey, you big Luddite!”) I’m not a Luddite in all areas, just a few areas related to technology, so I thought I’d start a series of Luddite Chronicles. Just to be clear, my Luddite tendencies are not due to technophobia. I have a MS degree in engineering and I taught computer science. What other categories of technology would you like to discuss? How about GPS vs the Atlas or the map? Anna, Ben–Hey thanks for those suggestions. I may not have Luddite tendencies in those areas, but they’d be worth a discussion.